Step into the shelter of the friendliest tent. 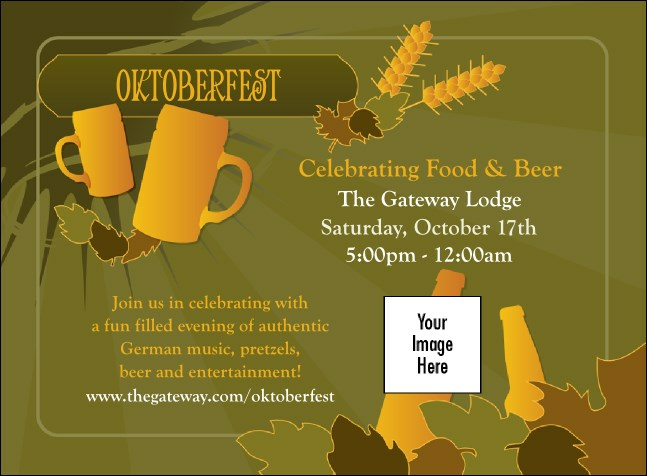 If you're celebrating beer and sausages, gather a crowd with the Oktoberfest Invitation template in green. Warm orange beer steins, beer bottles, and grains of ripe wheat adorn this autumn themed event Invitation with ten lines of text to fit all your event information. Rich and refreshing! It's foam-free design from TicketPrinting.com.